Joe Montana Football was intended to be the first football game available on the Genesis, but due to various development problems the game was released one month after John Madden Football. Developed by Electronic Arts, the game was not meant to be a direct competitor to their own Madden franchise. Rather, Joe Montana Football provides a lighter, more approachable arcade-style experience not unlike the Tecmo Bowl series. Emphasis is placed on the passing game which results in bigger plays and more prolific scoring, and frequent turnovers mean that each side gets a high number of possessions. The game makes use of a passing window that is called up after the ball is snapped, and shows a pseudo-first person perspective through the QB’s facemask. You can cycle between the 3 receivers to find the open man before throwing the ball. Unlike other arcade-style football games like Tecmo Bowl, this game features a pro-caliber playbook on both sides of the ball which makes Joe Montana Football feel more realistic than other games of its ilk. Three game modes are available; “Normal” is a single game against an opponent of your choice, “2:00 Drill” puts you in the classic Joe Montana situation where your team is behind by 7 with 2 minutes to go, and “Sega Bowl” is a 4-round playoff culminating in Sega’s version of the Super Bowl. As is common with sports games from early in the 16-bit era, it is not possible to play through a season. The game does not have an adjustable difficulty setting, but the Sega Bowl mode is significantly more challenging than normal mode, which can get boring for a seasoned player. The game runs a bit more smoothly than Madden, perhaps due to the simpler graphics, which while colorful and pleasant to look at, are not as detailed. Outside of the visuals, any comparison between the two games would be one of apples and oranges. 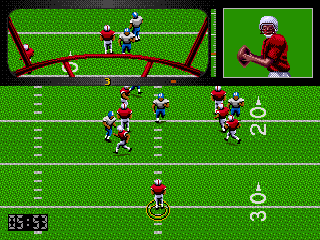 Joe Montana Football stands on its own as a great arcade-style football game. Buy Joe Montana Football on GameGavel or Amazon. Tagged Football, genesis, Joe Montana Football, Review, sega, Sports. Bookmark the permalink.